St Paul’s Church Hammersmith, the Parish Church of the area, is late 19th Century, being put up in 1882-91 to the designs of Gough and Roumieu. 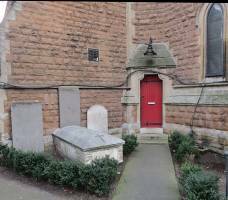 As such, we would not immediately expect much by way of monuments within it, but a goodly number were taken from the previous church on the site, which was built in 1629-31 as a chapel of ease to Fulham Church. Hammersmith was then just a hamlet, and it was only in the mid-19th Century that its population took off, especially in the 1860s after the railway arrived. 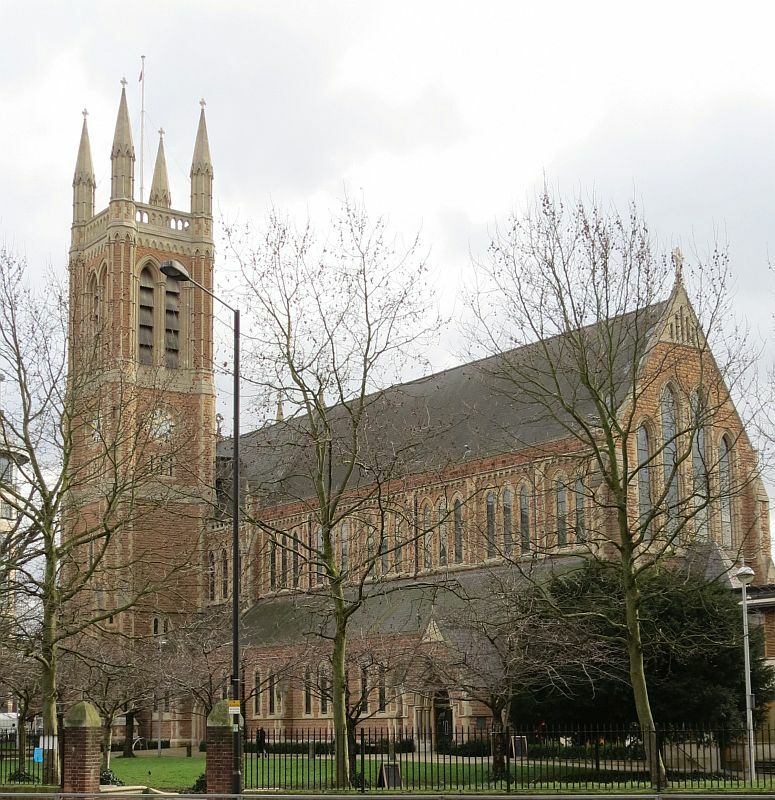 So Hammersmith outgrew its small 17th Century church, which was pulled down to make way for the current one. 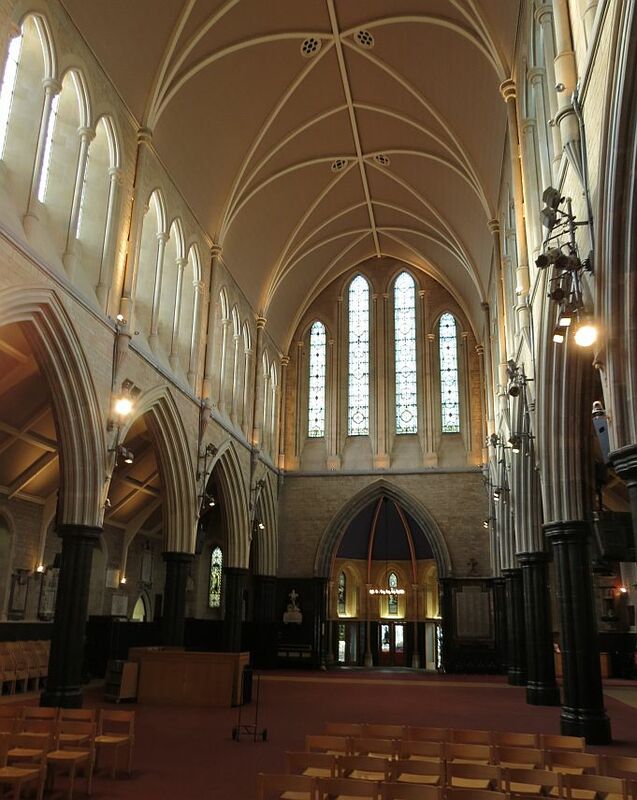 St Paul Hammersmith: views showing nave and tower . 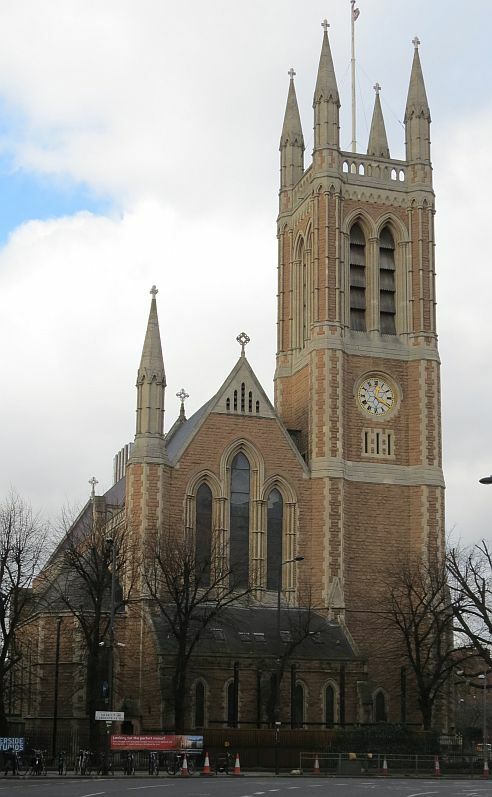 What we see today is a lofty church of brick, with stone dressings, and a tall roof to the nave. There is a fine tower with large pinnacles at the top, this being the most characterful part of the exterior, presenting good views from across the busy road. Inside, the height appears even greater, and there is a breadth and scale which is impressive, though it does make the interior look rather bare. 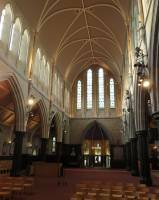 The tall nave is separated from the aisles by a long array of Gothic arches. The monuments, mostly small panels, line the walls. There are something over 40 of them, mostly taken from the previous church on the site, though not all the monuments were preserved. Those that survive include two important 17th Century panels, several 18th Century, including five from the very end of the Century, and most of the rest being 19th Century. In terms of sculptural adornment, with the exception of the important bust of King Charles I, and the other 17th Century bust, of James Smith, we are in the realm of rather slight work, with half a dozen pots in relief, and a fair dusting of minor carved details. However, a strength of the collection is the series from the 1790s through to the 1850s, where we see a fair range of the types of white-on-dark wall panels, with the coloured marble monuments from just before, and several newer colourful ones at the end, dating from around the end of the 19th Century and through to WW1. We take the monuments, as usual, in date order. 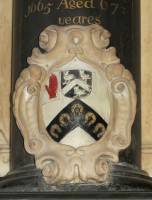 Edmond, Lord Sheffeild, Earl of Mulgrave, d.1646 . Rt Hon. Edmond, Lord Sheffeild, d.1646 . His other titles were 'Earle of Mulgrave, Baron of Butterwicke, and Knight of ye most noble order of Ye Garter'. It was he who bought the site for the original church, or chapel as it then was, and petitioned Bishop Laud to erect it. The inscription, in small capitals, notes that ‘the Garter was confirmed on him by Queene Elizabeth for his valiant service in 88 against the Spaniard, he being then Captaine of the ship called the Beare, and Command[r] of a Squadron of Ships’; later, ‘By King James he was made President of ye north, where he governed many years with such integritie, that injustice was never layd to his charge’. 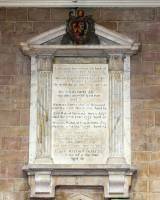 Script below writes that his wife, ‘The Vertuous, Pious and truly Noble Lady Mariana, Countesse of Mulgrave’ erected the monument. The panel is tall, and has an upper and lower shelf, the latter with two moulded brackets, but the sculptural decoration of the piece is the surround to the shield of arms above, which is carved with an encircling strap with a wreath of flowers, fruits and leaves climbing up it; at the top is a crown. The backing is a light grey marble cut to shape. I would think that the shelves and this grey backing are 19th or 20th Century embellishments to the panel and shield of arms, which survive from some earlier, probably larger monument. 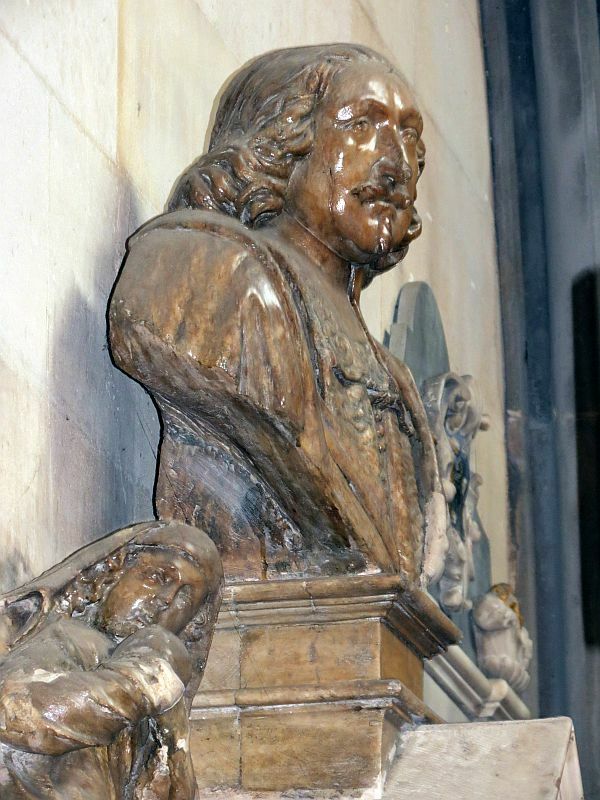 Monument to Sir Nicholas Crispe, Bt, d.1665, with Le Sueur's bust of Charles I . 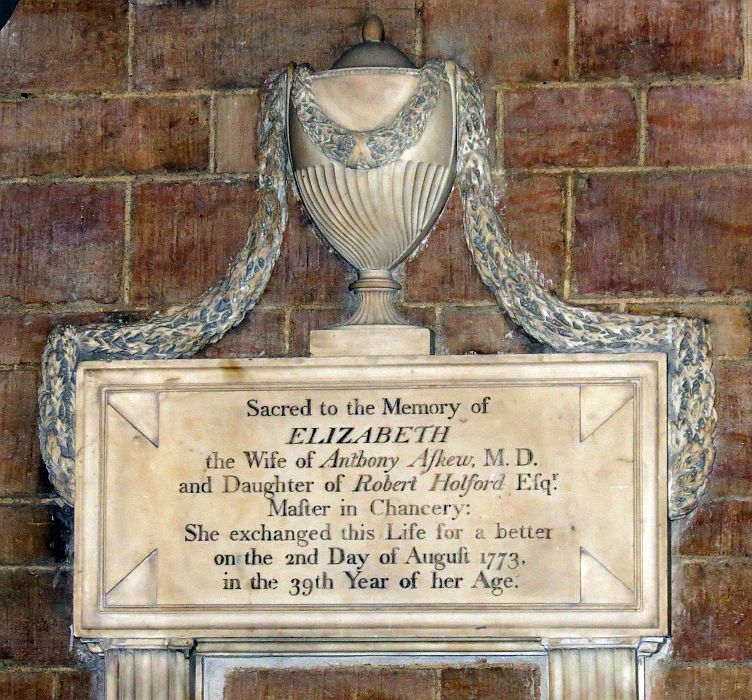 Sir Nicholas Crispe, Baronet, d.1665 , a compound monument, with an urn which once contained his heart, as noted on the inscription on the pillar supporting it. 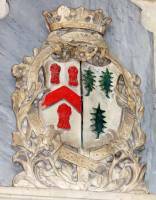 There is a painted cartouche of arms on the pillar, and beneath its base, a bracket carved with a winged cherub head, and with curly side pieces. 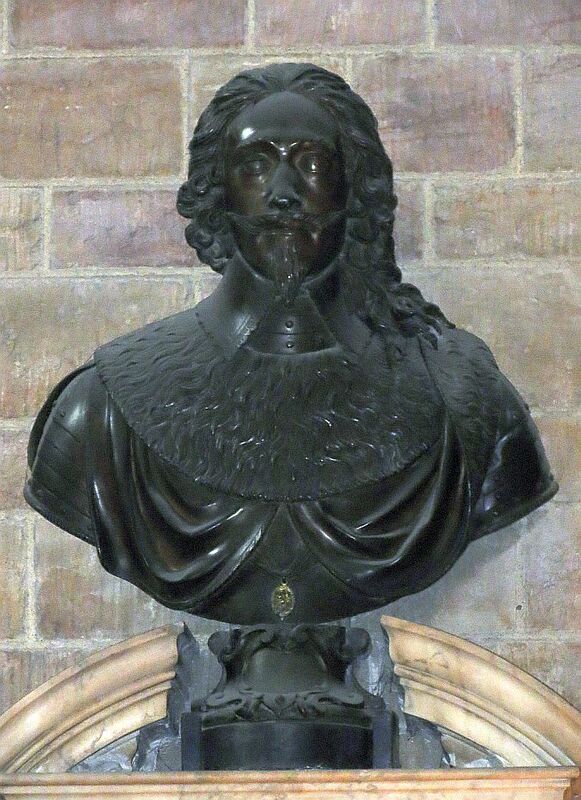 Above the urn, a bust of King Charles I rests on a base with segmented pediment, and the note that Sir Nicholas had it erected (during his lifetime) ‘as a gratefull Commemoration of that Gloriious Martyr King Charles the first of blessed Memory’. 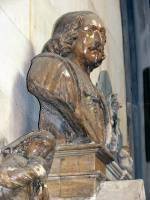 The bust is by no less a sculptor than Hubert Le Sueur, who made the famous statue of Charles I in Trafalgar Square. The face stares straight ahead, there is the well known moustache and little beard, and the rather puffed look to the face which is a characteristic of works by Le Sueur. His neck is enclosed in a collar, above a furred shoulder piece, and below that, plate mail. An important piece. 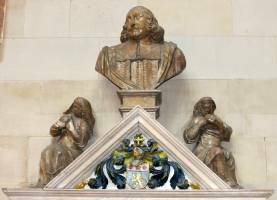 Sir Nicholas Crispe, merchant and loyalist to Charles I, built himself a mansion at Hammersmith, and gave £700 including materials for the building of the original chapel. As noted, it was only Sir Nicholas’s heart that was originally entombed here – the cheerfully barbaric custom of the time was to fish it out once a year and pour a libation of wine onto it. 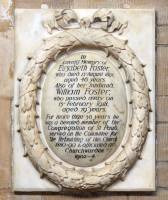 The rest of his body was buried under a tomb at St Mildred Bread Street. 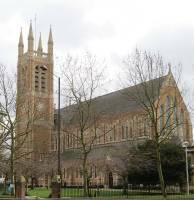 That church is long gone, and in 1898 the tomb was moved to Hammersmith, and the body and heart brought together once more. The solid tomb chest still remains outside – see bottom of page. James Smith monument, d.1667 . 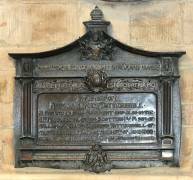 James Smith, d.1667 – ‘Cittizen and Salter and Sometimes Alderman of the Citty of London, who sin’d also for the office of Sheriff and was one of the Governours of Christs Hospital’, noting charitable deeds and many children – he also donated some of the Church plate. 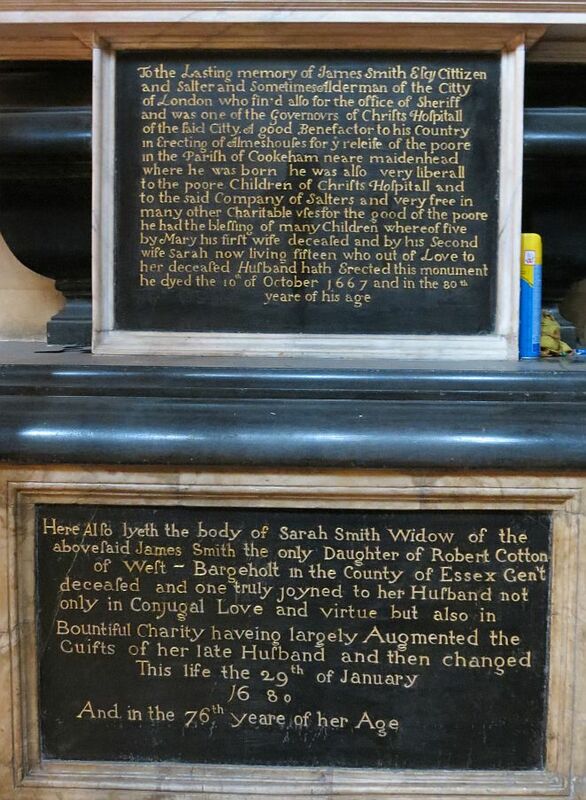 A panel below commemorates his second wife, Sarah (Cotton) Smith, d.1680 , who had erected the monument. This grand piece rises in several stages. 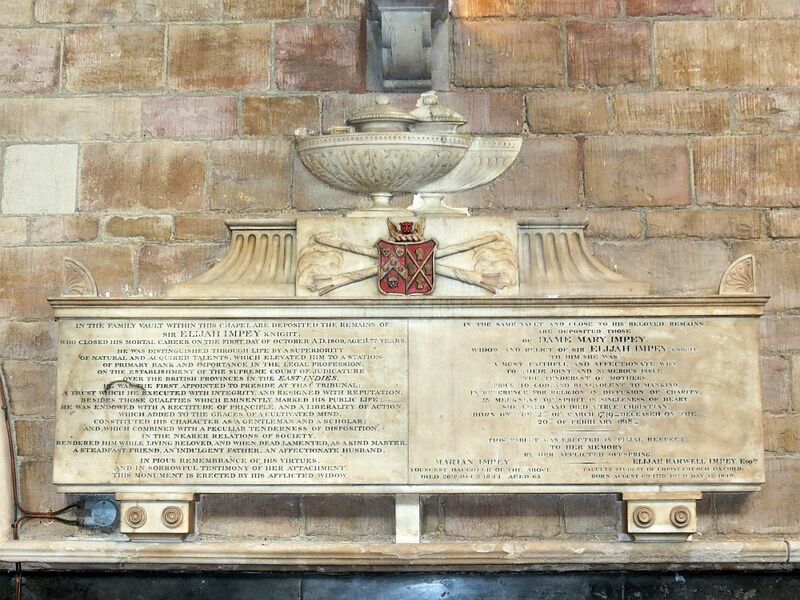 Lowest is a black chest, with inscription noting the monument was removed from the old church in 1882, and restored and re-erected by the Salters Company, 1917. On top of this a second altar chest, with orangey alabaster decoration at the ends in the form of Acanthus leaves. 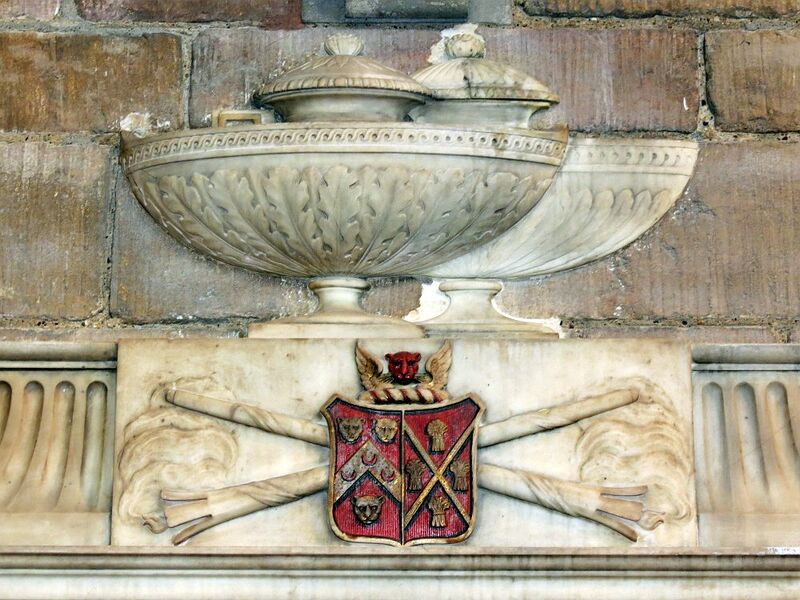 On this rests the sarcophagus of James Smith, with panel in front of it, and above is a shelf and a triangle, too tall for a pediment, enclosing a painted shield of arms. On the sides of this are seated two small statues of females, seated, who are the two wives, each cradling a swaddled infant, and at the very top is a bust of James Smith, to a larger scale, and with flowing locks of hair and moustache. 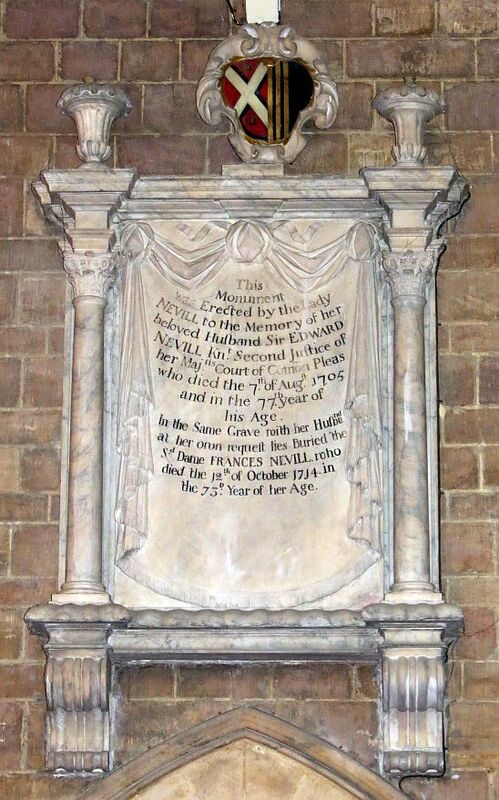 Sir Edward Nevill Kt, d.1705 , second Justice of her Majesty’s Court of Common Pleas, erected by his wife, Lady Frances Nevill, d.1714 , who is also commemorated. Carved in the rather elegant style of a hanging drape. As is usual, the drape is held at top and sides, with drop folds down the sides to give something of a frame, and a fringe. Unusually, this is set within a Classical surround, with Corinthian pillars to the sides, with over sized extensions on top, each supporting a jelly-mould style pot; in the centre is a painted cartouche of arms. At the base, a wavy shelf, and the whole is supported on two solid, moulded and fluted brackets. 18th Century classical panels to Nevill and Impey . Marie Hutchinson, d.1718 , and Michael Hutchinson, d.1740 , with a Latin inscription, tall panel with wide grey side borders, upper and lower shelf, Baroque-cut top bearing a cartouche of arms, and two flaming conches to the sides; at the base, heavy curved brackets with a semicircular central apron with further inscriptions. Christopher Thompson Maling, d.1744 , horizontal oval of white marble on a rectangular black backing, which bears four florets near the corners, and has two supporting brackets with mouldings. 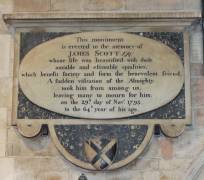 James Impey, d.1750 , father Elijah Impey, d.1756 , and relatives through to 1805. A grand Classical panel, thus with side pilasters, fluted and with leafy capitals, supporting a bulk pediment – there is no entablature to speak of – with in front of it a painted shield of arms in a gilt cartouche surround. At the base, a shelf with moulded brackets. The piece is in three different types of streaky marble. 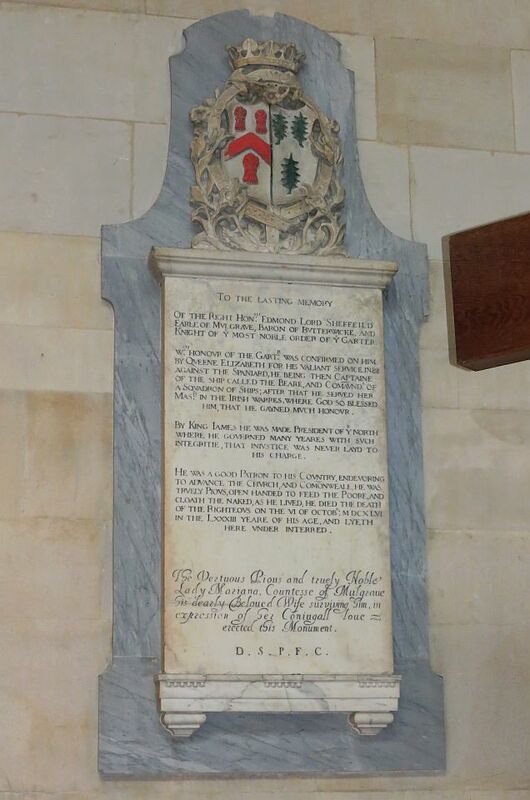 See also the later Impey monument, below. Thomas Worlidge, d.1766 , a painter, with a little poem, ending ‘Yet tho’ his mortal part inactive lies, // Still WORLIDGE lives, for Genius never dies.’ He was a portraitist, and etcher, publishing a series of etchings of antique cameos and gems. 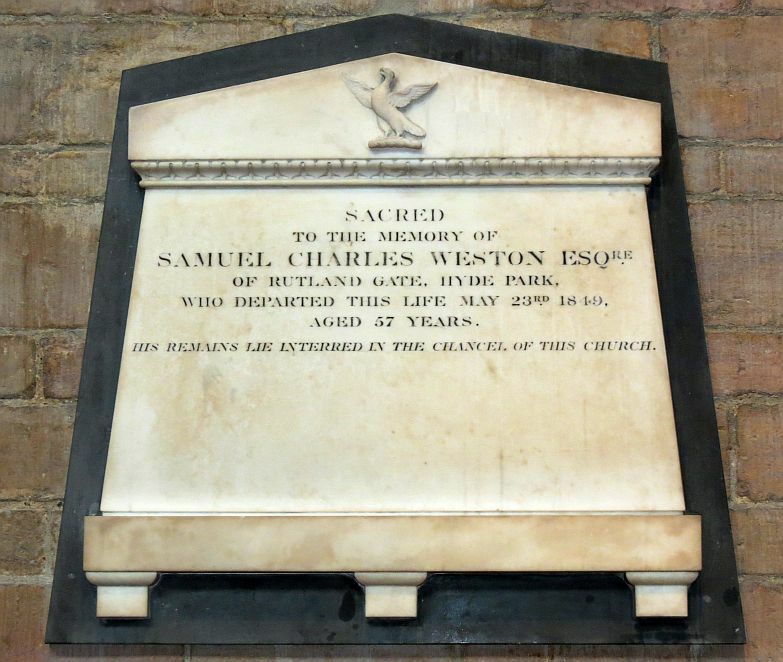 His monument is modest: a plain white panel cut with little feet. Elizabeth (Holford) Askew, d.1773 , panel with border, and an elegant narrow-stemmed Classical pot on top, with garlands falling on either side and hanging on the upper sides of the monument; there are two fluted supports below, and perhaps more which is concealed. There is no backing. See picture at top of page. 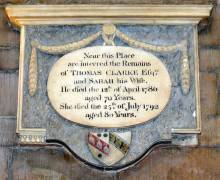 Thomas Clarke, d.1786 , and wife Sarah, d.1792 . An elegant little monument consisting of an oval with the inscription, carved as hanging from a pin with a flower, and with two festoons of leaves across the top, held by further nails, and depending from the sides. 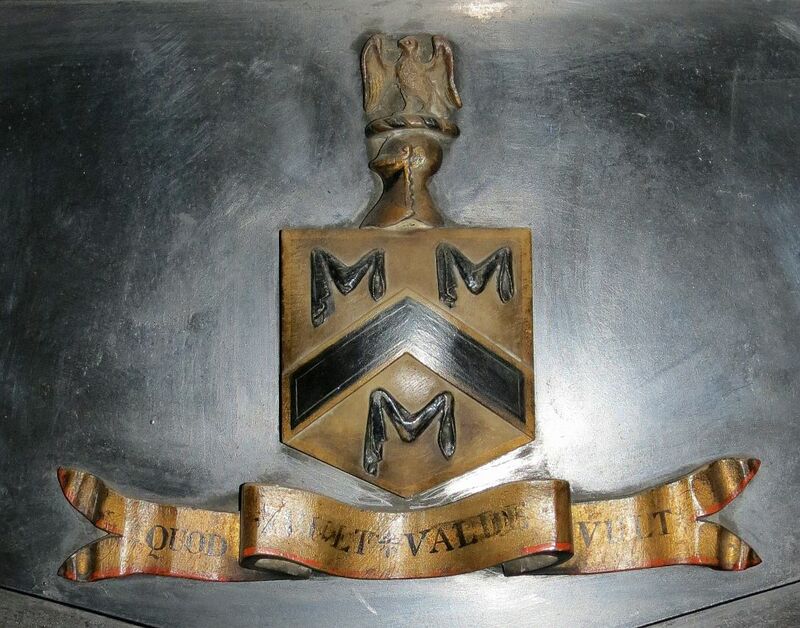 Behind is a grey panel, curved at the base to allow a painted shield of arms, and with a tiny balustrade on each side; one is missing, a narrow rim to the sides, and an upper shelf, all in white marble. Oval compositons: Thomas Clarke, d.1786, and James Scott, d.1793 . James Scott, d.1793 , an unconventional panel, with the inscription on a broad oval panel within a rectangular frame, the corner spandrels being of a grey, shelly stone, unusual on a monument. There is a shelf above, and below, a segment of a circle of the same grey, shelly stone, bearing a shield of arms; to either side are small ‘feet’ as semicircles with lightly carved shell patterns. Richard Alexander, d.1794 , wife Bridget Alexander, d.1770 , daughter Rachel Anderdon, d.1832 , her husband Ferdinando Anderdon, d.1834 , and three infant children, their daughter Rachel Susan Anderdon, d.1867 , and another daughter of Richard Alexander, Elizabeth Alexander, d.1844 . Tall panel with upper pediment, bearing two carved shields of arms, and feet below. Dimly signed by Bedford of 256 Oxford Street, a fairly prolific monumental mason. Stephen Wight, d.1797 , and wife Louisa Wright, d.1809 , and their daughter Louisa Harriet Wright, d.1864 . A tall oval panel within a rectangle, bordered by white marble and with a colourful grey, white and reddish marble in the spandrels. Above entablature of white blocks and a dark marble backing, the central block being carved in low relief with a stylised flower. Above, a shallow segmental pediment. By the masons Thomas Burnell & Sons. The design of the monument is characteristic of the mid-late 18th Century, thus rather traditional by this time. James Smith, d.1798, son Thomas Smith, d.1821 , and wife Mary Smith, d.1831 . An odd one – the broad oval inscribed panel is within a rectangle, the surface of which is fluted across its entire width. 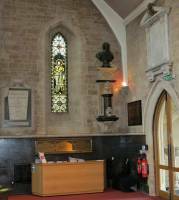 The surround is a streaky grey marble, with an upper shelf, again an unusual construction. Robert Taylor, d.1803 , wife Deborah Taylor, d.1807 , and their daughter Elizabeth Holland, d.1809 . White panel with inscribed line border, and around, a frame of fluted grey marble with blocks at the top bearing inscribed circle or boss designs. Restrained and functional. Arthur Murphy, d.1805 , plain white marble panel with thin upper shelf and cut with tiny feet. 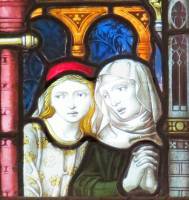 Robert Jones, d.1808 , mother Blanch Jones, d.1763 , and sister Catherine Peach, d.1803 . An unusual composition (see picture at top of page). The inscribed panel which is gently angled towards the base, is on a black backing, with the base resting on a greyed part of the panel with a simple wave motif on a small horizontal panel. To left and right are curved, fluted sidepieces, resting on corbels carved with Acanthus leaves; between these is the apron, which is wavy and includes a thin snake biting its own tail. At the top of the side pieces are small carved flowers. At the top is a narrow border on which rests a pot in relief, without backing, and covered asymmetrically with a drape, which trails over one top corner of the monument. Not unsuccessful, but it is not clear what effect the mason was aiming at. Sir Elijah and Dame Mary Impey, with doubled urn, by Peter Rouw . 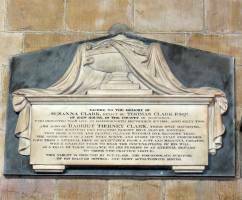 Sir Elijah Impey, Knight, d.1809 , ‘distinguished through life by a superiority of natural and acquired talents, which elevated him to a station of primary rank and importance in the legal profession’, president of the supreme court of the British Provinces in the East Indies. 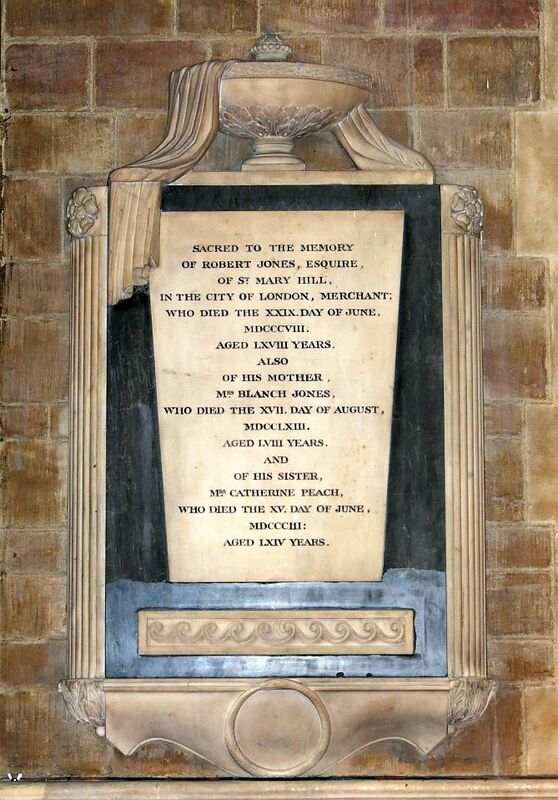 The monument was erected by his wife, who is commemorated by a parallel panel, Dame Mary Impey, d.1818 , also commemorating a daughter, Marian Impey, d.1844 , and Elijah Barwell Impey, d.1849 . Above the pair of monuments is a single long shelf, with acroteria at the ends, and a central raised plinth, fluted and with a painted shield of arms in the centre, two crossed torches, downward pointing, behind. On top are a pair of funeral urns, one in alto relievo, the other, behind, in low relief, signifying the two deceased. At the base, a thin shelf and two thick brackets with roundels, along with a smaller central one. There is no backing panel. One of brackets is signed by the sculptor, Peter Rouw, New Road, Hammersmith, a significant, local man. John Taylor Holland, d.1811 , a youth of 15. One of those tall panels with room for many relatives, but left empty. It has a black inscribed line border, and a surround consisting of a grey, fluted surround, with blocks of white, streaky marble at the corners with inscribed concentric circles. 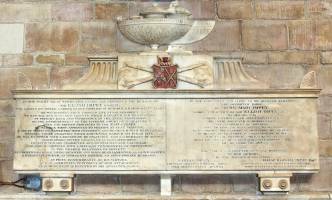 Sophia Davies, d.1816 , wife of Major Arthur Davies of the East India Company, cut as a tomb chest end with feet and a thin upper shelf. 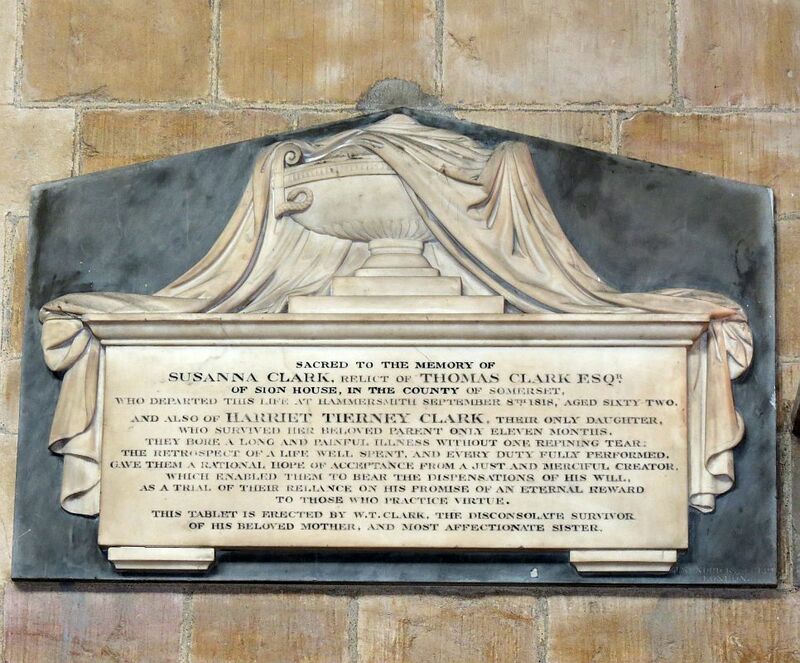 Susanna Clark, d.1818 , and daughter Harriet Tierney Clark, d.1819 . As a tomb chest end, with feet, upper shelf, and a high relief draped pot on top, the drapery reaching across the broad width below and hanging down the sides, asymmetrically but carefully balanced. A nice example of this type of monument. Notice the little snake across one side of the pot, here denoting wisdom (see this page for more of sculptured snakes and their significance). By the sculptor J. Kendrick of London. John Brown, d.1823 , blocky panel with upper moulded shelf, on a grey backing panel which looks upside down, cut to pediment shape at the base, and originally bearing four small flowers, one of which is missing, and with two brackets. Josephus Kendrick's monuments to Susanna Clark and Goerge Pring, early 19th C .
George Pring, d.1824 , surgeon of Hammersmith, signed by the sculptor J. Kendrick of London, whose work we have already met in the Susanna Clark monument noted above. The inscription is on a rectangular panel forming the base on top of which is a relief of a large pot, draped asymmetrically, above which floats a small shield of arms with a coronet and bird, perhaps a phoenix. Revd. George Bathie, d.1825 , and his wife Janet Lindsey, d.1825 . As a tomb chest end, cut with shallow feet, a prominent upper shelf, and above it, a lid with large acroteria carved with anemone patterns. On a rectangular dark backing. See also his sons below. Revd. 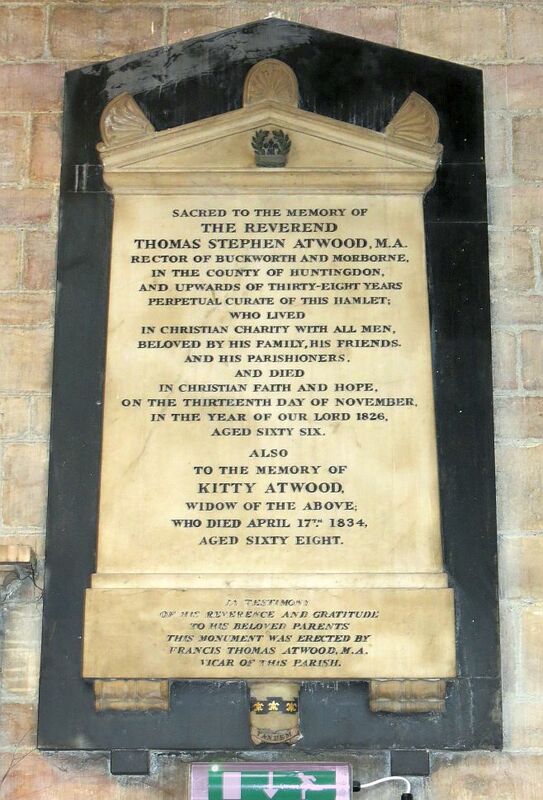 Thomas Stephen Atwood, d.1826 , Rector of Buckworth and Morborne, and Perpetual Curate of Hammersmith, and his wife Kitty Atwood, d.1834 , erected by Francis Thomas Atwood, their son, Vicar of Hammersmith. Tall panel with upper pediment and lower shelf, in a characteristic blocky style popular at around this time. The pediment bears a small coronet with wreath, I think, and upon the pediment are three acroteria, again rather blocky, carved with anemone patterns. 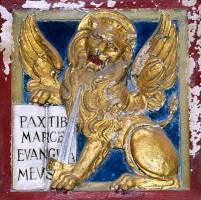 At the base, a small painted shield of arms with the motto ‘Tandem’ or ‘Together’. The monument is upon a black backing. Revd Atwood, William Dawson, George Bathie and Sophia Fitzgerald . 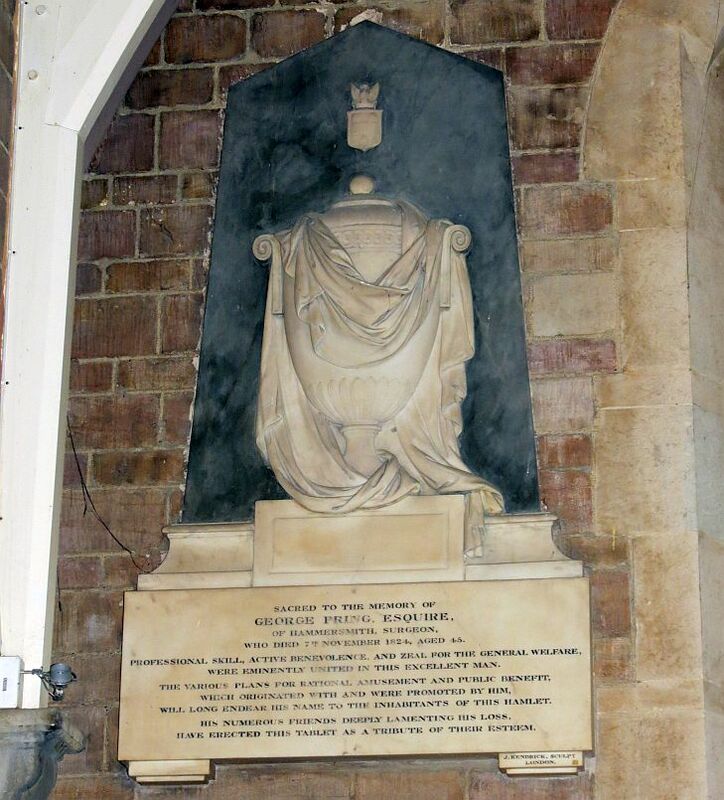 Richard Loveday, d.1812 , with a long Latin inscription; his wife, Maria Loveday, d.1801 , and Anna Loveday, d.1823 , are also commemorated, the monument being erected by the son, Lambertus Loveday, in 1827. 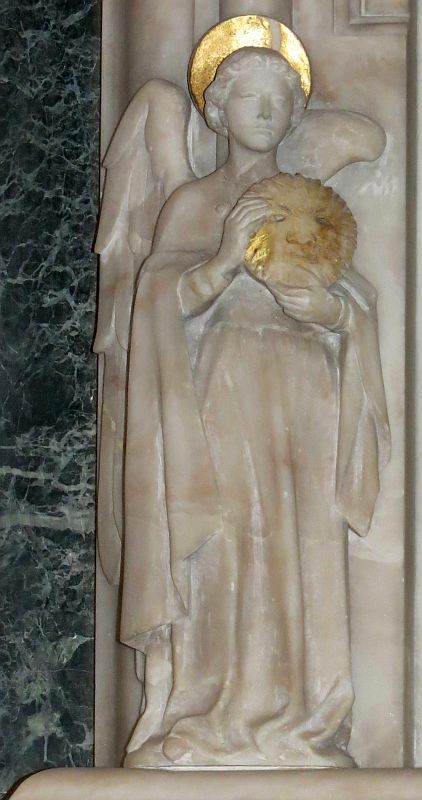 Plain white marble panel with upper shelf and lower lip. 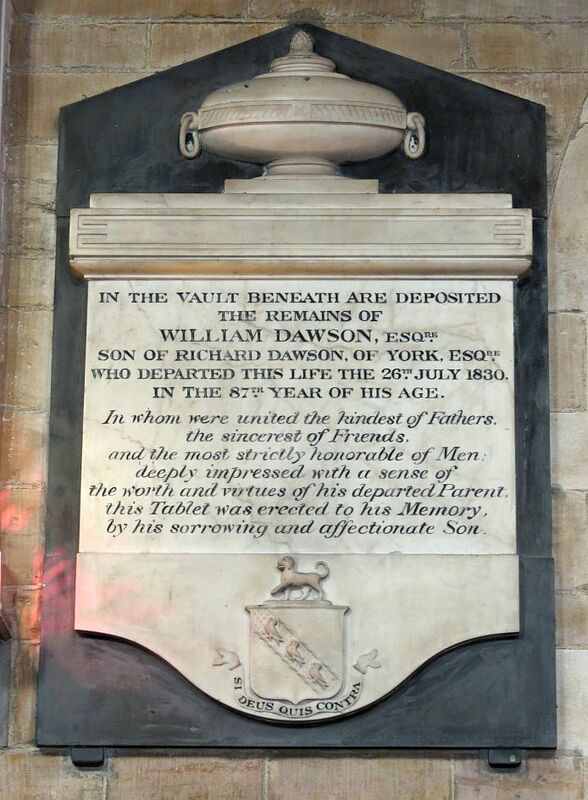 William Dawson, d.1830 , erected by his son. 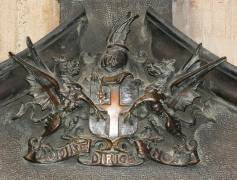 Panel with thick upper shelf with mouldings, and a wavy base on which is a shield of arms in high relief. 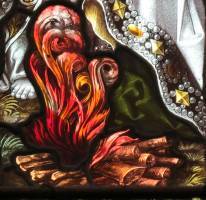 On top rests an oval-shaped pot, micely classical and with a small flame at the top, and the whole is on a shaped black backing. By the statuary Mullane, New Road, St Pancras. Applewhaite Frere, d.1830 , with a Biblical quote. It has an upper and lower shelf, and instead of a full black backing panel, there are side pieces doing duty as pilasters, and a top cut to pedimental shape. Two little block feet below. 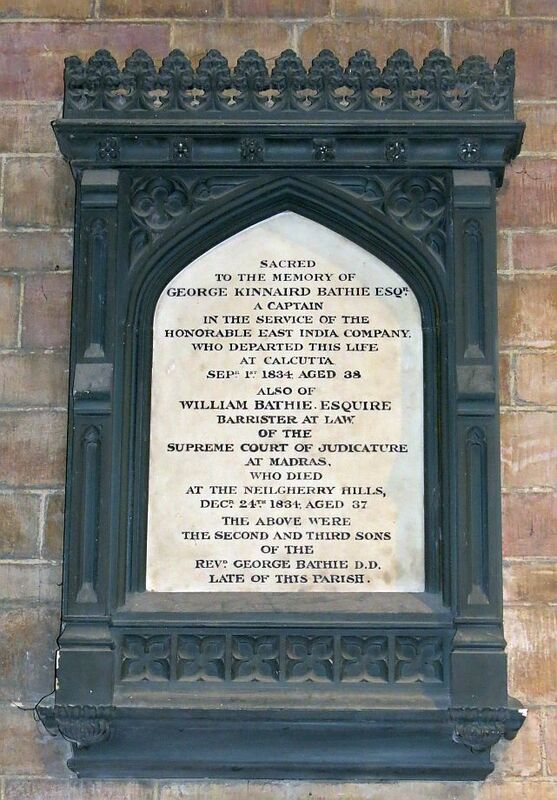 George Kinnaird Bathie, d.1834 , Captain in the East India Company, and William Bathie, d.1834 , Barrister at law of the Supreme Court at Madras, sons of the Revd. George Bathie noted above. A Gothic style, not quite Tudor monument, as a broad window within an outer rectangular surround, with side pilasters, spandrels decorated with quatrefoils in low relief, with a line of them also below, an upper balustrade of crocketing, and mouldings at the base. The carving, small emblems and repeating patterns, gives a sense of ornateness to the monument without requiring much skill in sculpture. Sophia Charlotte Fitzgerald, d.1834 , sons Robert George, d.1812 , and Charles Feilding, d.1817 , and daughters Emily, d.1816 and Louisa, d.1816 , infants Mabel and Gerald , and their father, Lord Robert Fitzgerald, d.1833 . 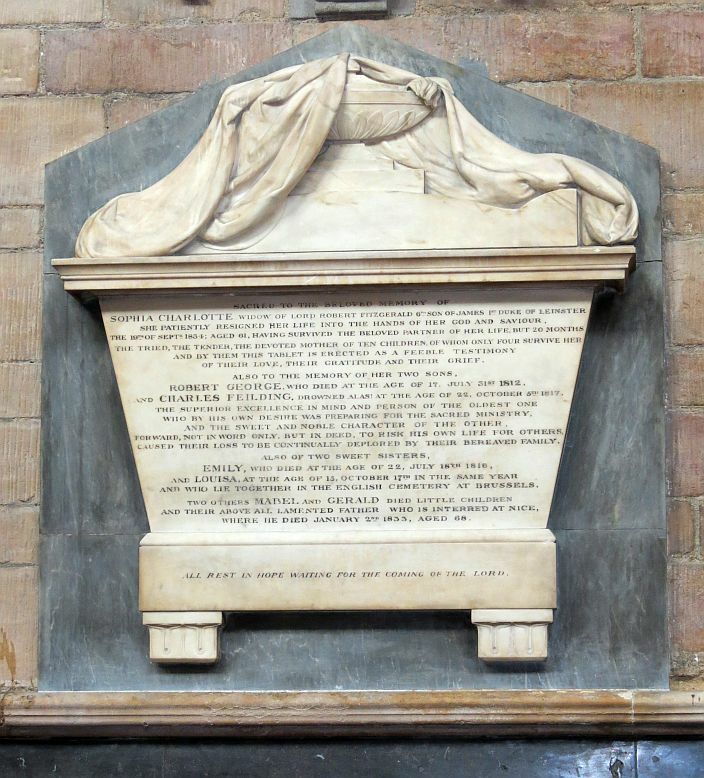 Closely set small text covering the side of a casket end design, with feet, and a lid above a shelf, bearing a broad pot partly veiled by a large drape which falls asymmetrically over the top of the monument. On a grey, shaped marble backing. Mary Ann Gibbes, d.1834 , as a tomb chest end, with upper and lower shelves, small feet with mouldings, a lid above, and angled lines at the sides. On a black shaped backing. Arthur Edward Baron Booth, d.1844 , Frederick Craford, d.1834 , his brother, mother Ann Booth, d.1837 , and father Captain William Booth, d.1857 . Panel with inclined edges, upper and lower shelves with mouldings, and a pot of top, draped asymmetrically. On a rectangular black backing. Geraldine Augusta Fitzgerald, d.1846 , broad panel as a tomb chest end, with upper lid above a shelf, bearing a low relief angled cross in a circle, and with little blocky feet below. Samuel Charles Weston, d.1849 , panel with upper pediment bearing a carving of a phoenix about to take flight (more phoenix iconography on this page). Below, a base with, unusually, three supporting feet. On a black backing. Signed by the Marble Works, Esher Street, Westminster. Weston and Tierney Clark monuments, mid-19th Century . James Chettle Gomme, d.1850 , auctioneer and builder. With thick upper lid or blocky pediment bearing some damaged central device incorporating a ribbon, and carved flowers at the corners, and thick lower shelf; on a black backing. George Bird, d.1851 , and William Bird, d.1844 , panel with upper shelf, the moulding of which is carved with a repeating pattern, and held underneath a narrow lower shelf by two brackets, scrolly fluted ones. The whole is affixed to a rectangular black panel with two small block supports of its own. William Bird, d.1861 , to the same design as that to George and William Bird, above. Signed, but I could not make out the signature. 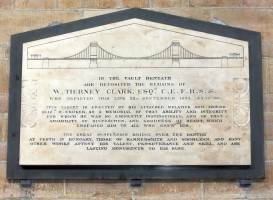 W. Tierney Clark, d.1852 , civil engineer and early suspension bridge designer, known for his bridge over the Danube in Hungary. He made a bridge for Hammersmith too, but that is long gone (the current one is by Bazalgette, who made the Victoria and Albert Embankments), but in Marlow is a surviving suspension bridge by him. 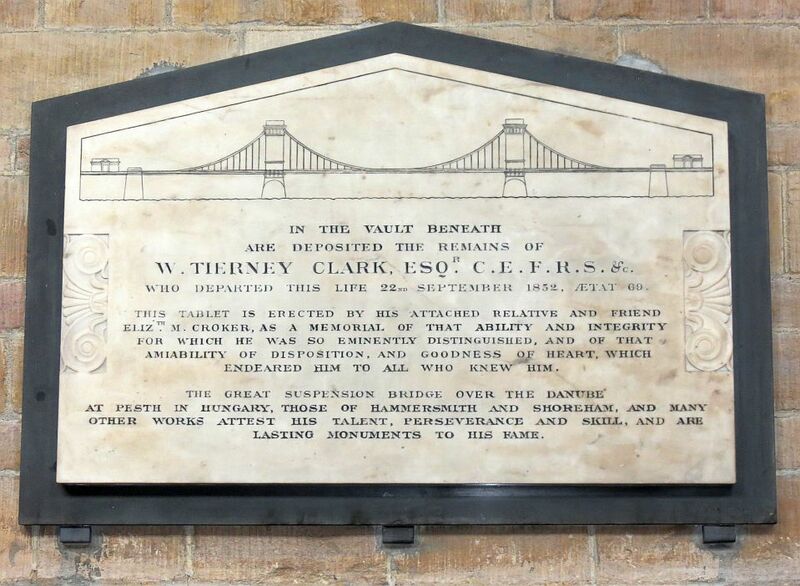 The white panel contains an inscribed line drawing of a suspension bridge (see picture above right, click to enlarge), and to the sides, scrolly patterns in low relief. On a black backing panel. 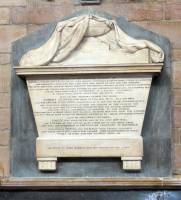 The monument was designed by the Westminster Marble Company, Earl Street; I have seen other work by this company, workmanlike but not ambitious. Ann Mansell Mansell, d.1874, by E.J. Physick . Ann Mansell Mansell, d.1874 , second wife of Commander William Mansell RN , noting her remains are interred in the same grave as her husband’s first wife Susanna Maria Mansell, also their child John Surman Walter, d.1852 . Commander Mansell died in 1886, and is also commemorated. 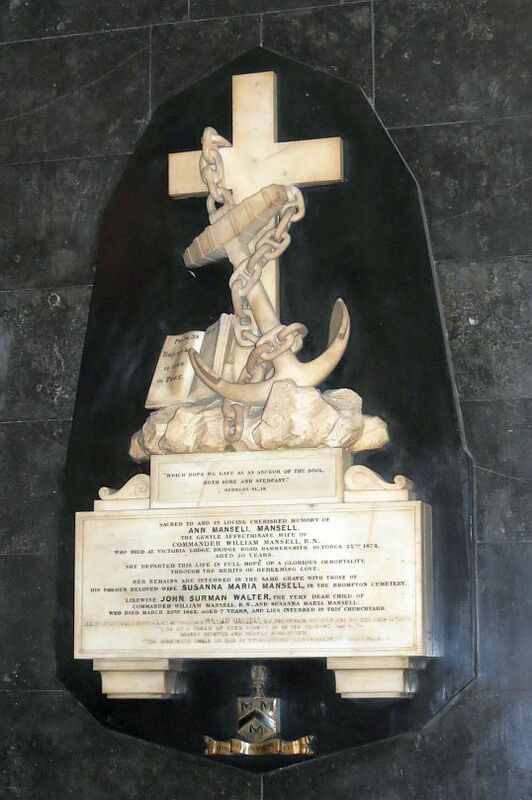 A rather splendid Victorian mural monument, with the inscribed panel as a tomb chest end, with block feet, a rectangular block on top with curly sidepieces, and on top of that, a carving of a crucifix with anchor and chain wound about it, resting on a rocky base, and an open book with Psalm 39, verse 8, ‘Truly my hope is even in Thee’. The backing is cut into a single truncated obelisk above, and down to a shallow point below, allowing room for a small painted shield and motto. 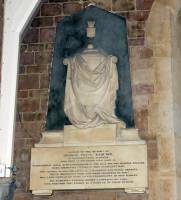 The monument is by the sculptor E. J. Physick. William Smith, d.1875 , plain white panel. F.H. 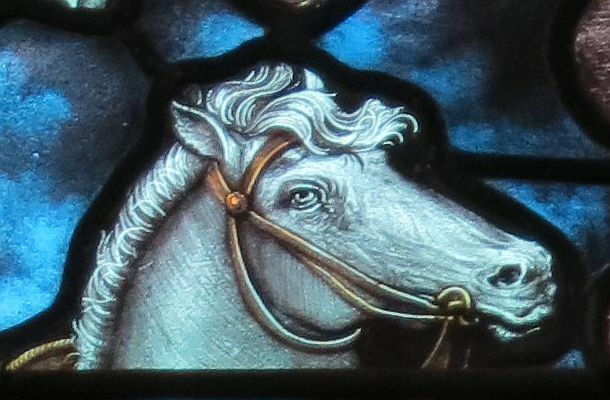 Tattershall, d.1900, and detail . Francis Henry Tattershall, d.1900 , a soldier in the Boer War. A good example of a turn of the Century bronze monument in Arts and Crafts style. The central panel has a narrow surround to the sides, fluted Ionic side pilasters, and above, a motto and central wreath and sigil. 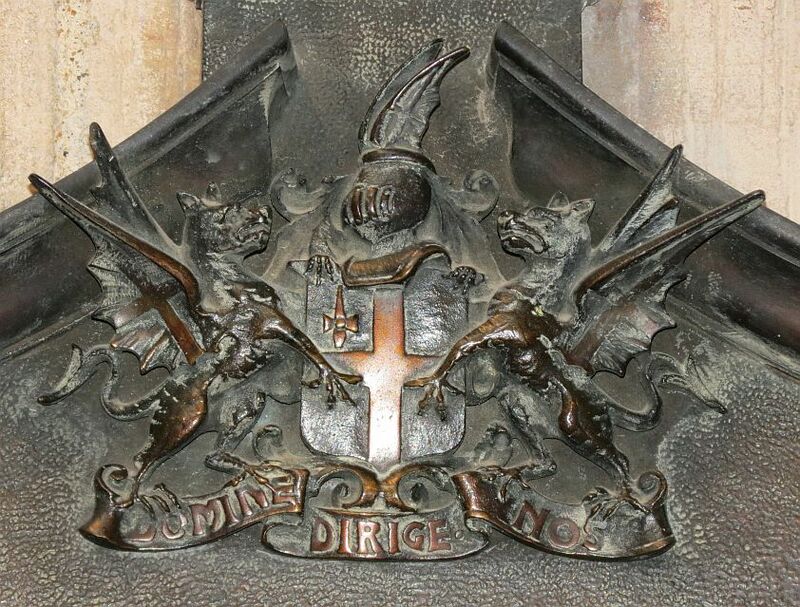 Above, a sort of curvy pediment, with protruding upper edge, and a City of London shield and supporters – two dragons – nicely rendered: under this is his regiment, The City of London Imperial Volunteers. At the base, centrally placed is an ornament with scrolling. The outer border of the panel is gently curved into organic shapes. A good thing of its time. 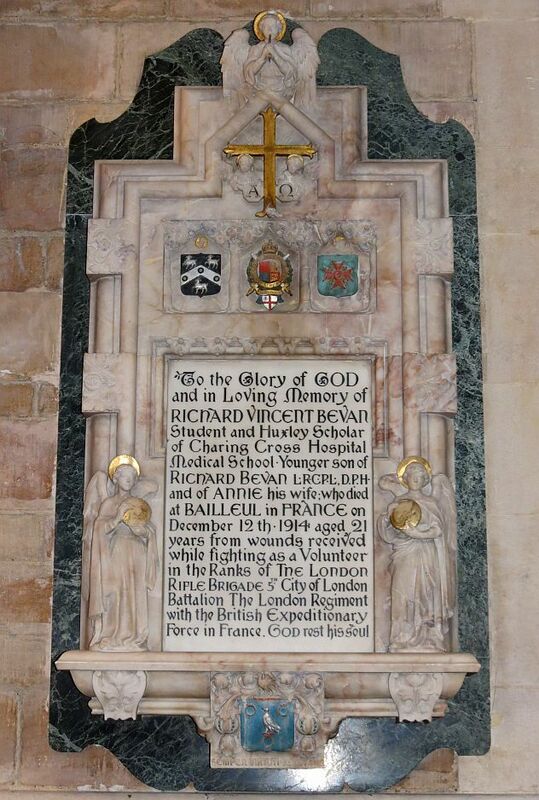 Richard Vincent Bevan, d.1914 , fallen in battle as a volunteer in the London Rifle Brigade at Bailleul, France. Colourful Arts and Crafts monument in pinky marble with serpentinite surround, with painted shields of arms and some gilding. The wide border to the inscribed panel includes a pair of angels to the sides, nicely carved, each holding a gilt disk, once of the sun, one the moon. Above, three coats of arms and a crucifix with two small half figures of cherubs peeking from under it, and on the very top, a half figure of an angel blowing either a flute, or more likely a trumpet which has had the end lost. Nice low relief carved details elsewhere, mostly floral. Lieutenant Lewis Henry Frederick Bryett, d.1918 , from wounds in action at Haussy. Gothic rectangular panel with cusps at the corners, and a frame, in creamy marble. 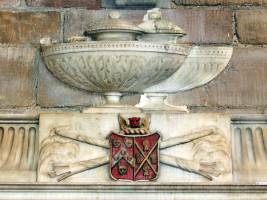 Around this is a narrow border of streaky marble, raised at top and base to allow for the regimental motto and arms. 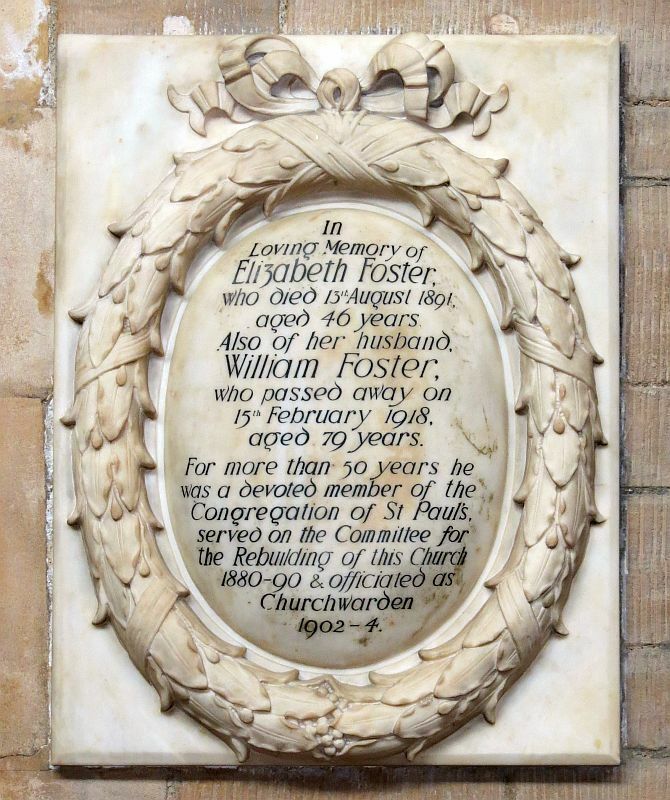 Elizabeth Foster, d.1891 , and husband William Foster, d.1918 , an oval composition with the text surrounded by a carved wreath of leaves (Bay leaves?) and small berries, tied with ribbons at the top, on a white backing panel. Well executed. Arts and Crafts monuments, early 20th Century . 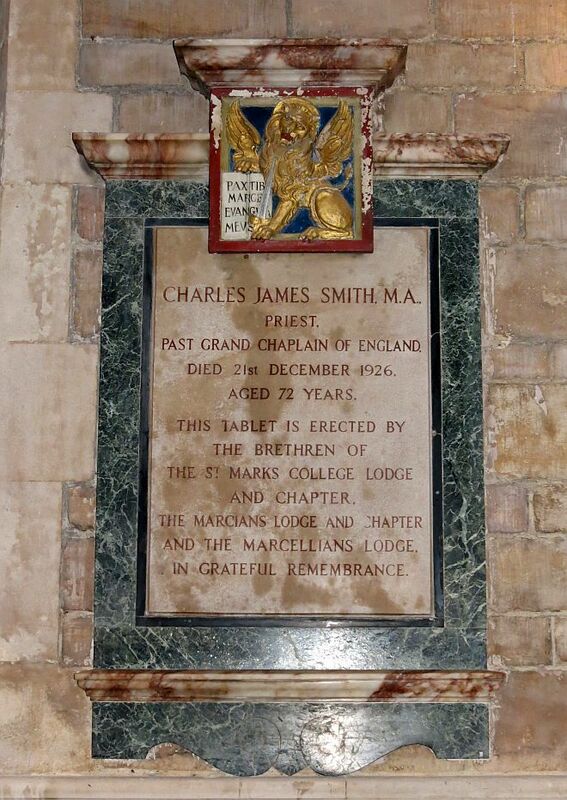 Charles James Smith, d.1926 , Priest and past Grand Chaplain of England. Splendid panel in colourful marbles favoured by the Arts and Crafts movement of quarter of a century earlier. The inscribed panel, a pinkish brecciated marble, has a thin black border surrounded by a serpentine frame, with upper and lower shelf of dark and light pink marble or alabaster. 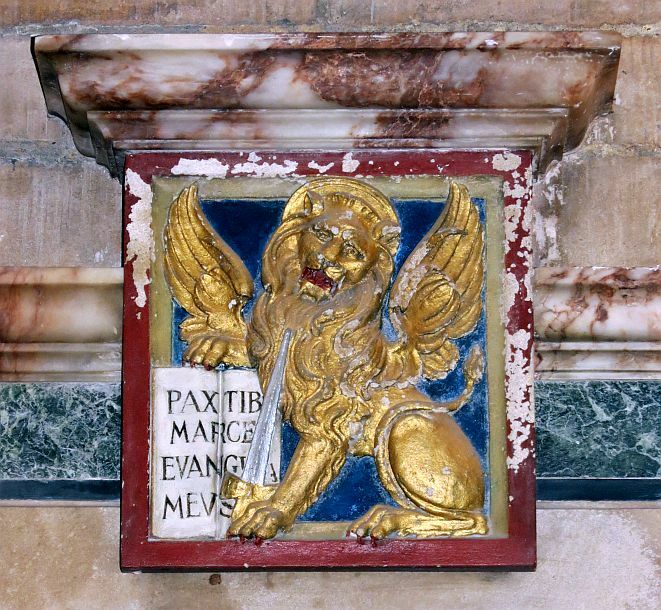 Affixed over the upper centre, with a shelf of its own on top, is a low relief gilt carving of a winged Lion of St Mark, and the motto ‘Pax tibi Marce, evangelista meus’, or Peace be with you, Mark, Evangelist Mine’. At the base, a small apron of the serpentine cut with scrolly outline. It is notable that the monument is made with costly materials rather than costly sculpture, a characteristic of the times. James Lee, d.1824 , and wife Sara Elizabeth Lee, d.1827 . Styled as a Gothic window with uncoloured lettering, inscribed crucifix above, and narrow floral border. 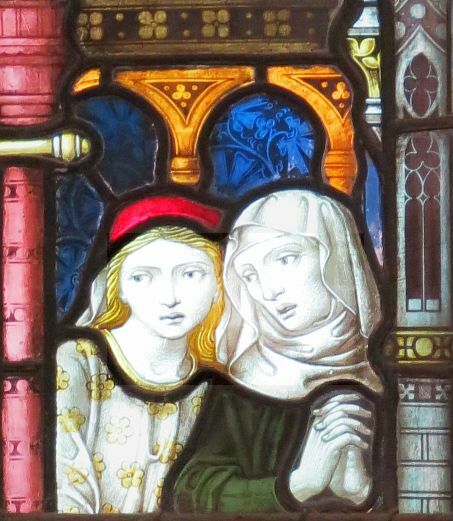 There is another panel to the same design to Joshua Edward Cooper, d.1837 , wife Elizabeth (Lindesay), d.1855 , and her sister Anne Lindesay, d.1849 . 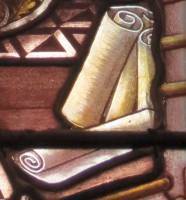 John Hampden Nowden, d.1907 , Vicar of Hammersmith for 22 years, pinky brass panel with red capitals, and wavy line inscribed border. Thomas Chamberlen, d.1912 , first Mayor of Hammersmith, and, incidentally, owner of the building firm which had put up the current Church building. 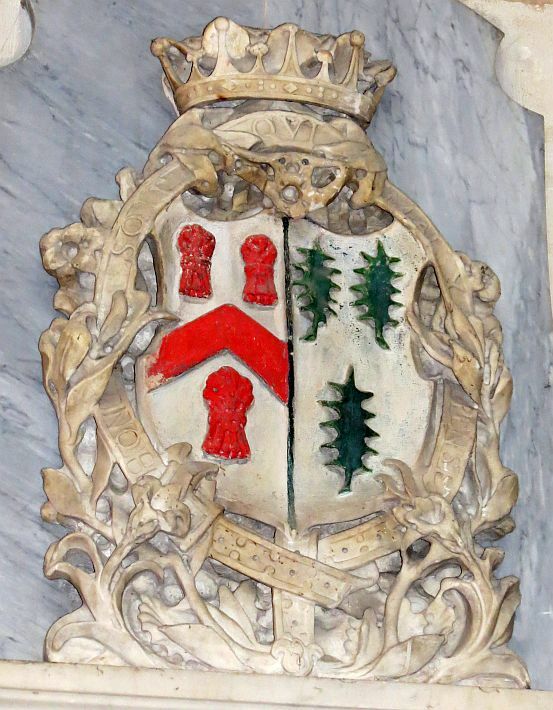 Typical of the time: brass panel with border decorated with repeating pattern, here with leaves, and a coat of arms, picked out in white and red. Heavy, black letter text. Set on a black backing panel. Revd. W Surman Mansell, d.1914 . Black text with red capitals, the inscription as if on a trefoil window, with the spandrels covered with a stylised leaf design, and a border of repeating square patterns. 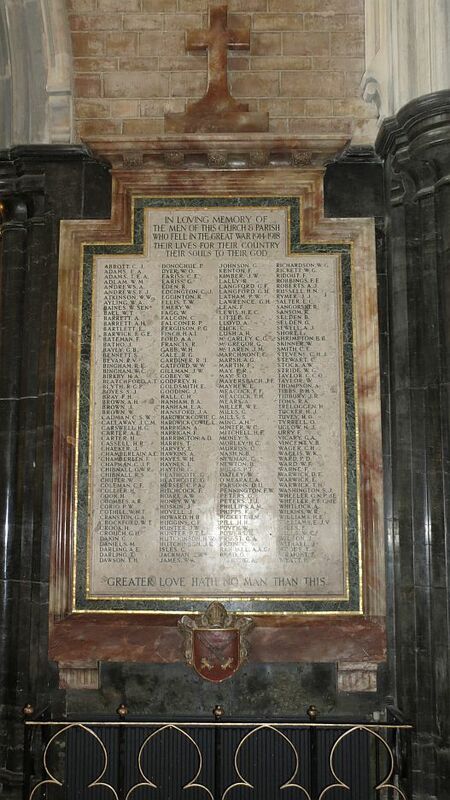 World War I memorial , alabaster panel with pinkish outer border, then green, then the pale speckled inscribed central panel (picture below, click to enlarge). A crucifix is on top, and a shield of arms at the base. 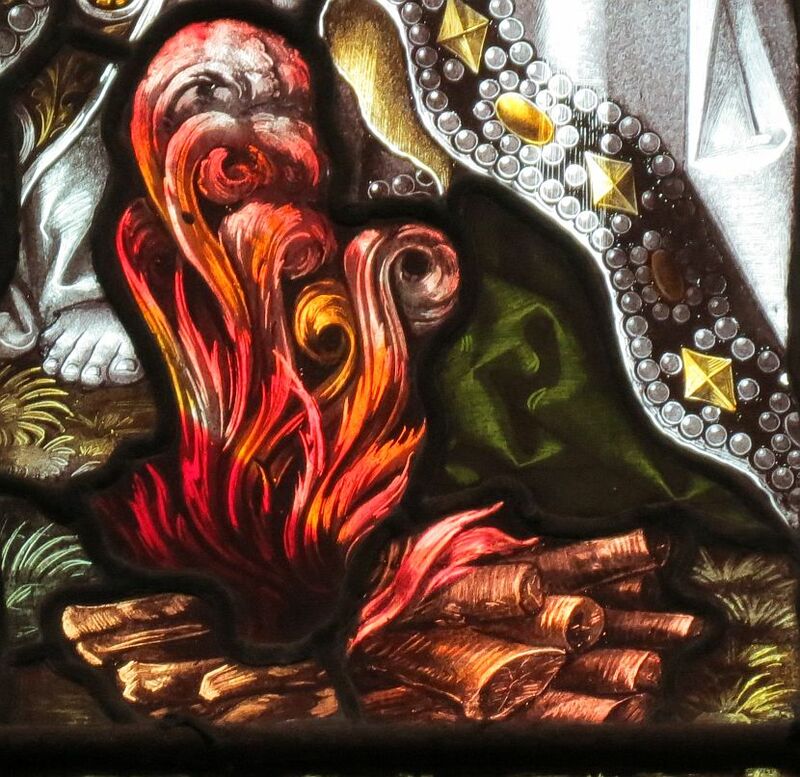 Characteristically colourful and of its time. World War II Hammersmith Fire fighters memorial , a marble panel with three motifs, one of which, LFB, refers to the London Fire Brigade, and text in different colours. 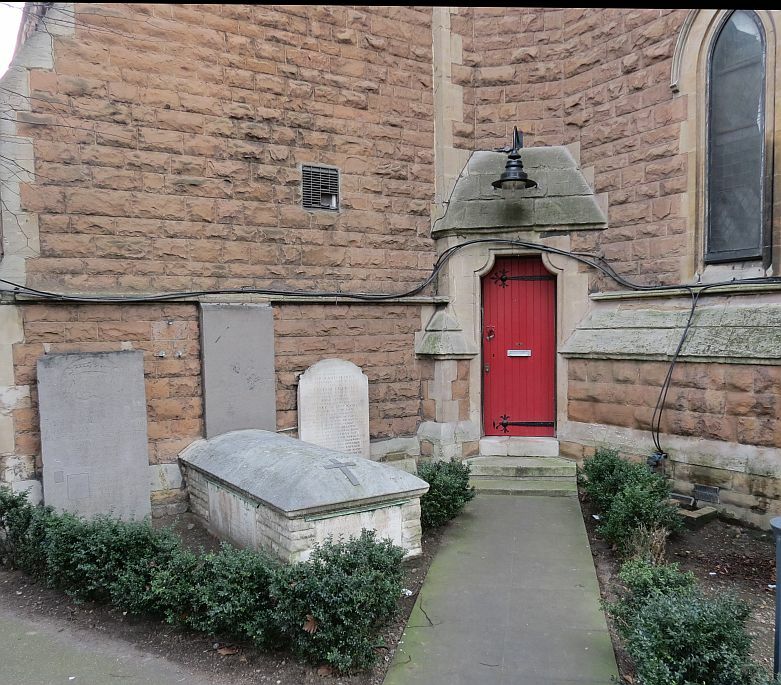 The original enclosed churchyard was radically reduced in size to put up Hammersmith Flyover, and the various monuments swept away, with a few remaining in odd corners. 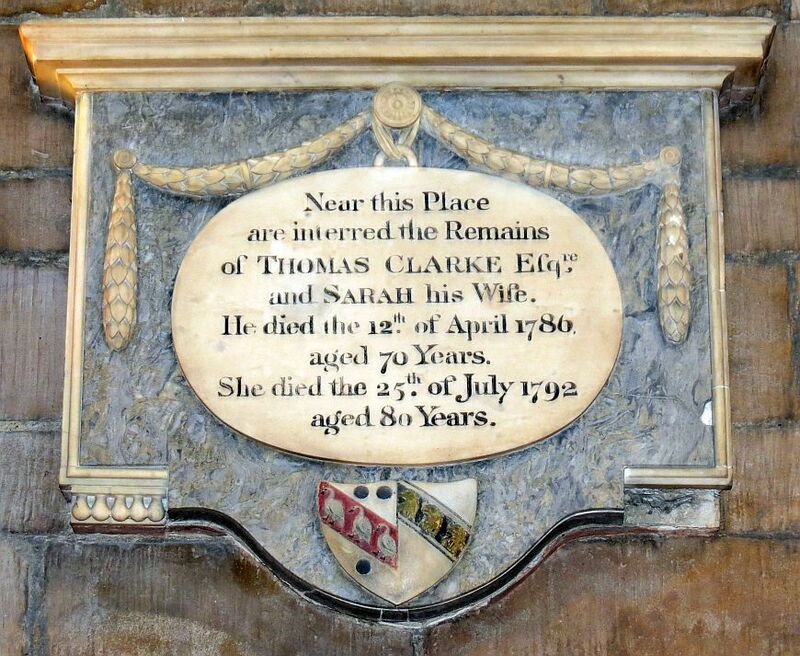 These include a couple of tomb chests, of which one, surrounded by a low railing, is apparently that to Barbara Banks, d.1763 (see picture, top of page to far left), though the inscription is terribly crumbled now. 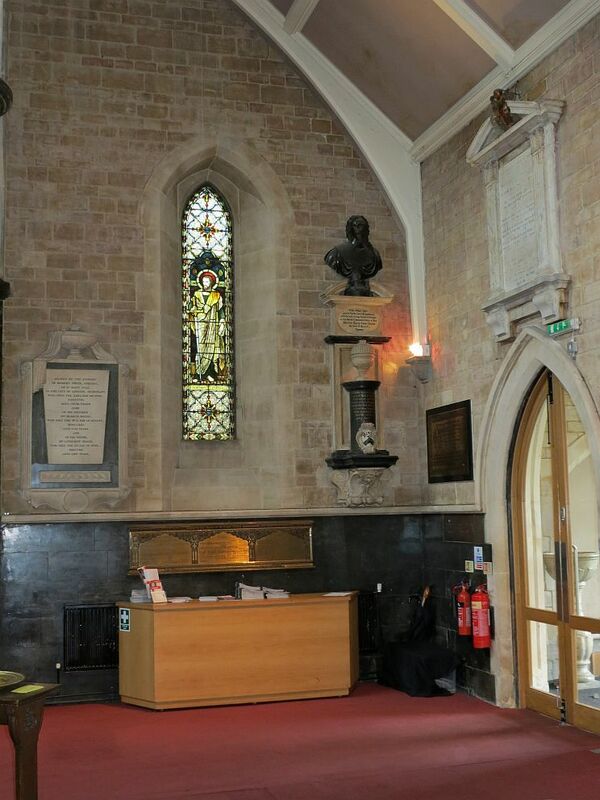 Most importantly, as noted earlier, by the side of the Church near the rear side door is the tomb chest of Sir Nicholas Crispe , he of the heart, and bust of King Charles I. 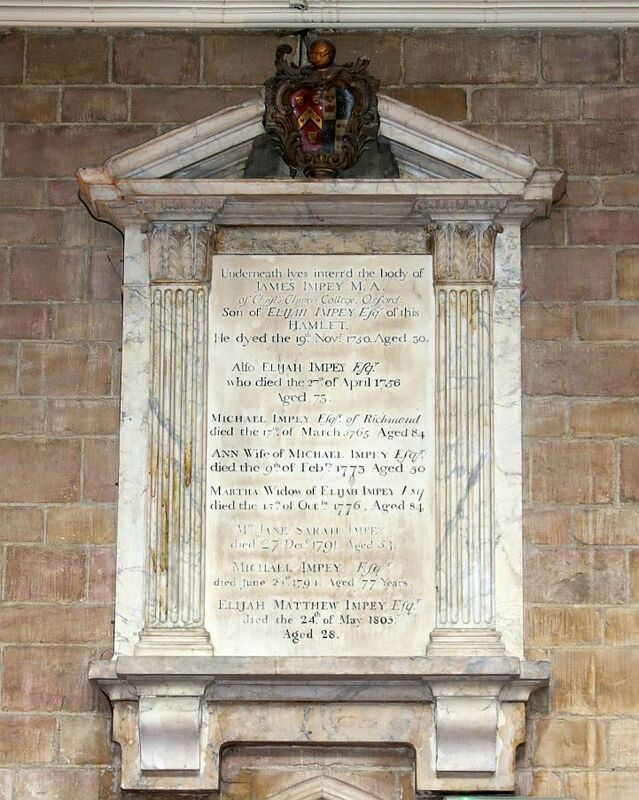 It consists of a low block of masonry, with the original inscribed panel at the front end and a panel noting its move from St Mildred Bread Street on the side. On top is a domed panel with a crucifix upon it. 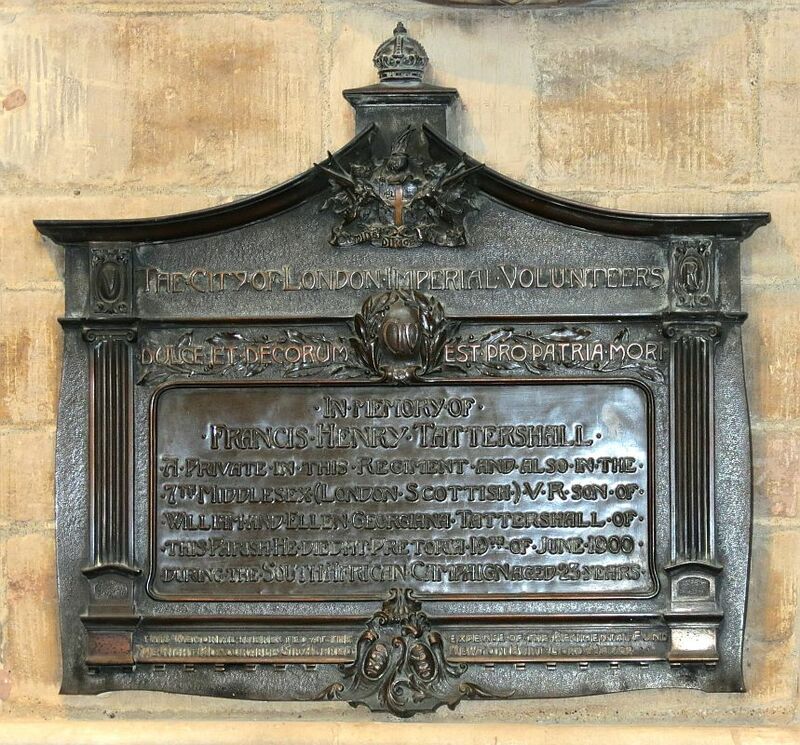 Behind, against the wall, is a vertical panel with inscription – it was originally the floor slab within the Church – and we can see Sir Nicholas’s shield of arms, still fairly distinct. 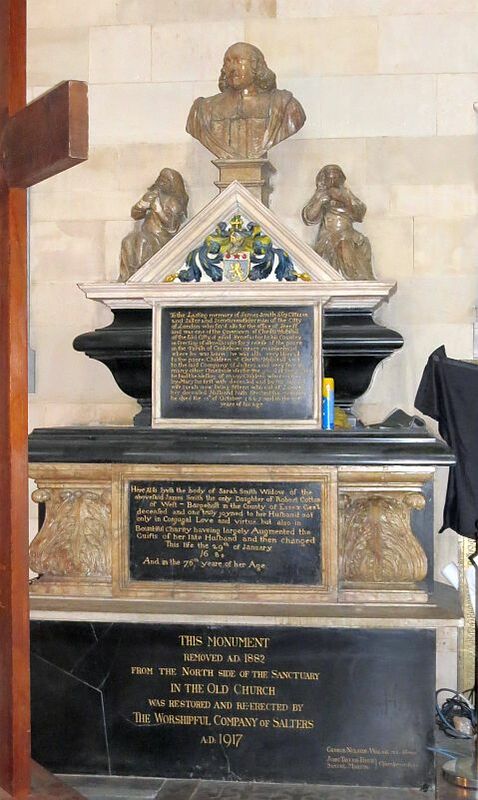 Sir Nicholas Crispe's tomb . Another floor slab placed vertically against the wall of the Church, next to the Crispe one, is to the Marquis of Heucourt, d.1703 , and has a double-shield of arms. 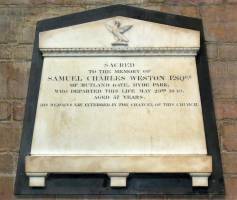 With many thanks to the Church authorities for permission to show pictures of the monuments inside; their website is http://www.sph.org/Groups/124436/St_Pauls_Hammersmith.aspx.